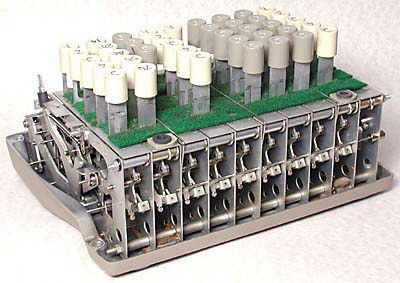 Imperial weight, key-driven ("Comptometer") type, with abbreviated keyboard (only has keys 1 to 5). To enter a number greater than 5 two keys have to be pressed in succession in that column.. 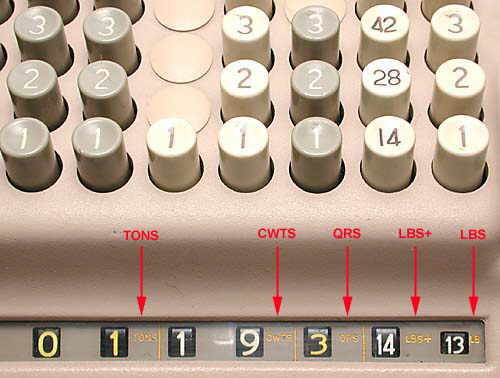 It is a model 509/Y where the 5 denotes the abbreviated keyboard (keys up to 5), the 09 denotes the 9 columns of keys, and the Y probably denotes an Imperial weight (Tons, Qtrs, CWT, Lbs) version. 241 x 182 x 177 mm (9.5" x 7.2" x 7.0"). Made by Bell Punch Co. Ltd. in England, distributed in U.K. by Sumlock Comptometer Ltd. 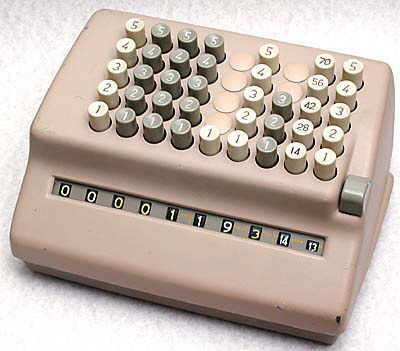 The machine illustrated has serial number 509/Y/876.514, and has the angular style casing which was introduced in 1958. 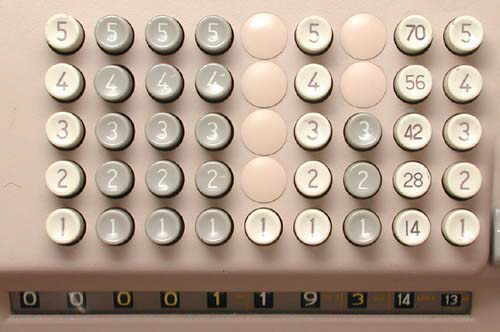 This machine has an abbreviated keyboard - it only has keys 1 to 5 in the standard decades columns, so to enter a number greater than 5 you have to press one key followed by another which add up to the number required. Compare it with the slightly different 509/SP weight calculator. The machine in the photographs is displaying the total of 1 Ton, 19 Hundred-weights, 3 Quarters, and 27 Pounds. With the cover removed, from the rear. Fortunately, Britain changed to the metric system during the 1970s and 1980s and this complicated system of units is now virtually obsolete. It does not appear to have been used in modern times in the U.S.A. where weights are customarily given in Pounds (lbs) only. 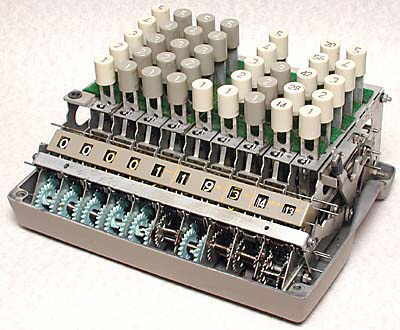 No electronic calculators are known to have been sold which use this weight system, though a Sumlock-Anita engineer says that he was involved in the modification of some ANITA electronic calculators to this system for Britain's National Coal Board in the late 1960s.